Antonio Villas-Boas/Tech InsiderMy 2012 MacBook Pro. It will be a sad day when the MacBook Pro I bought in 2012 becomes old and unusably slow and I’ll have to buy a new MacBook Pro. But thanks to a simple yet effective feature in MacBook Pros made between 2008 and 2012, my laptop will live on until at least 2020, and probably longer. Normally, with the way I use my computer, it would have lasted two years and I would have had to buy a new computer for $1,800 or more. What’s this feature that holds the secret to longevity? The source of the fountain of computer youth that let me keep that $1800+ for better things? A removable bottom that let me switch out the RAM. Ever since 2013, Apple’s MacBook Pros were made with unibody designs, which means they don’t let you remove the bottom to add parts and upgrade your computer. That’s why the last great MacBook Pro was the 2012 model. RAM, for those who might not know, is your computer’s backpocket where it stores everything you have open on your screen, including apps and web browser tabs, so you can use and access them quickly. Without enough RAM, your computer will be slow, and as apps and websites evolve, they will use up more RAM over time. My 2012 MacBook Pro came with a measly 4GB of RAM, which realistically isn’t enough power by today’s standards if you have three or more open apps and 20+ open Chrome tabs. To give you some perspective as to how little 4GB of RAM is, many recent flagship Android smartphones come with 4GB of RAM. Tech InsiderThese are RAM ‘sticks.’ They look daunting and scary, but they really aren’t. Note: these aren’t the original sticks that came with my MacBook Pro. The other parts in my 2012 MacBook Pro, like the super-powerful Core i7, are more than enough to handle my everyday work tasks, so it seemed like a shame to throw it away just because the other crucial part wasn’t sufficient. The RAM was the weakest link. 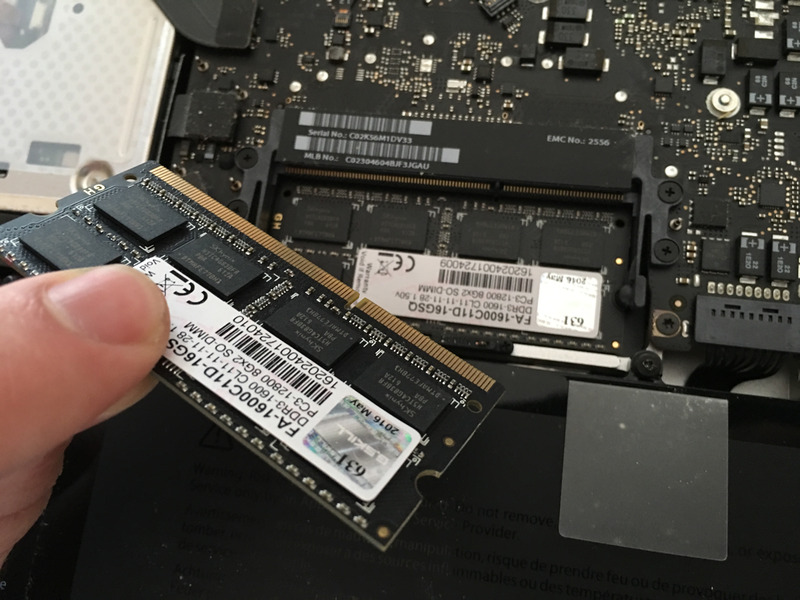 So, instead of buying a new $1,800+ MacBook Pro in 2014, I replaced the RAM, which was cheap and easy to do. I spent $80 on 8GB of RAM and installed it myself. It’s so insanely easy that anyone could do it, as there’s no special skill or computer-know-how required. Fast forward to 2016 and I felt my computer slow down as it ran Chrome, Slack, Tweetdeck, Photoshop, Spotify, Wunderlist, Messages, Preview, and an app called Skitch we use at Tech Insider to highlight certain aspects of photos. So I bought more RAM — this time 16GB for $60 — and added it myself. In total, I spent $140 to upgrade my MacBook Pro instead of buying a whole new one for $1,800 or more. Antonio Villas-Boas/Tech InsiderHere I am, merrily switching out the RAM in my MacBook Pro. And, if ever I need more, I’ll spend under $100 again to get even more RAM and it will still be cheaper than buying a new one. Don’t get me wrong. 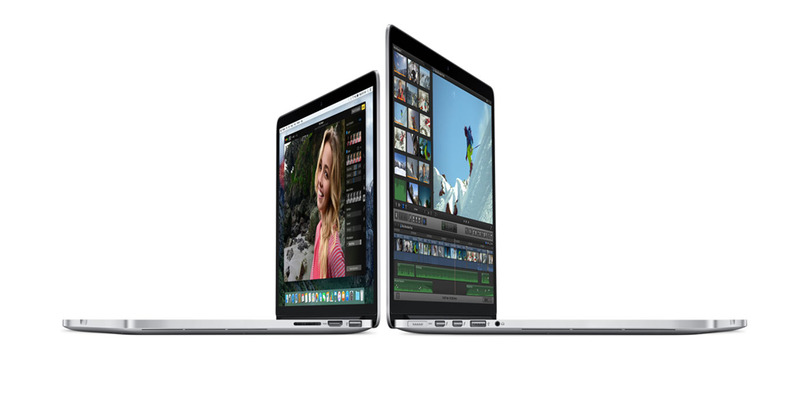 Apple’s latest crop of MacBook Pros it released in 2015 are excellent. 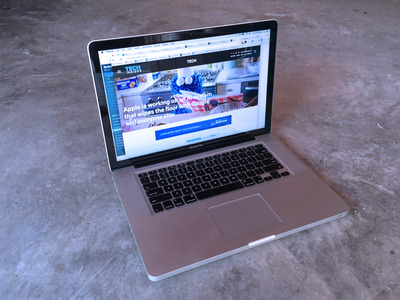 For $2200, you can get a 13-inch MacBook Pro with a similar setup as mine: A super-powerful Core i7 processor and 16GB of RAM, and it should last most people a very long time. And it’s thinner, lighter, and it has a sharper Retina display compared to my big, heavy MacBook Pro. 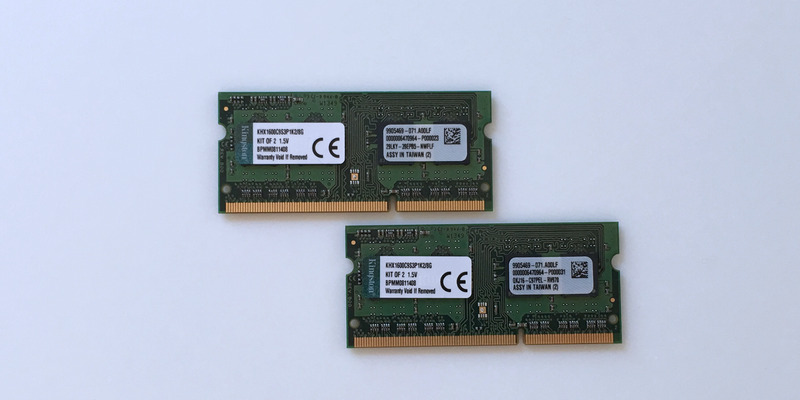 But the day will come when those 16GB of RAM won’t be enough and you’ll have to spend the big bucks to buy a new laptop much sooner than you could have because you can’t replace the RAM. The Core i7 processor will still be fine, though. AppleMacBook Pros from 2013 onwards are thinner and have sharper Retina displays. Apple is set to release brand new MacBook Pros this year, with rumours pointing towards a refreshed design and a fancy row of keys you can customise to do whatever you want, like open certain apps or perform certain functions. However, there are no rumours that Apple will reintroduce the removable bottom, and it’s unlikely Apple will do so. Buy a Windows laptop, you say? Some of those let you replace the RAM, you claim? Indeed, but I prefer the Apple’s computer operating system, Mac OSX, more than I like Windows 10. I’ll cross the bridge of buying a new laptop when I get to it. But for now, my 2012 MacBook Pro still has a lot of life left in it. Side note: I also replaced the original slow hard-drive that came with my MacBook Pro with a super-speedy solid-state drive (SSD). While it dramatically increased my laptop’s performance, I chose not to mention it in the main part of this article, as MacBook Pros made from 2013 onwards all come with built-in SSDs.